Diesel engines in buses, vans, cars and trains may be responsible for thousands of premature deaths a year and cost the NHS billions of pounds, say air pollution health experts. With government figures for 2008 showing 29,000 people dying prematurely from air pollution each year, diesel fuel burned in vehicles could be responsible for around one in four of all air pollution deaths, said Frank Kelly, professor of environmental health at King’s College,London. “We have walked blindly into a situation where we have a high percentage of diesels in the transport sector. All taxis and buses are diesel. From one in 10 private cars being diesel in 2000 it is now nearly half today. A lot of the minute particulate matter [emitted from exhausts] comes from diesels in cities. 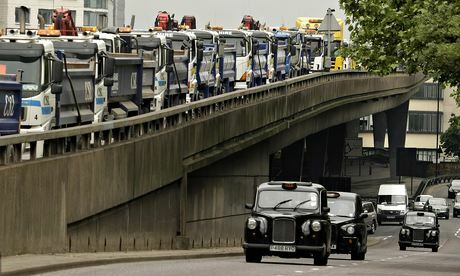 It is estimated that 50% of the particulate matter in London is from transport and that diesel makes up about half of all the transport,” he said. The new estimate follows preliminary analysis of the very high air pollution levels recorded this month across much of southern Britain when fine dust blown up from the Sahara desert mixed with heavily polluted air from British and mainland European cities to produce a dangerous smog. Researchers at King’s College London have suggested about 70% of the minute particles of dust in the air could have come from outside Britain, with around 20% composed of Saharan dust. “But this pollution episode was not a natural phenomenon as was suggested in some media. The bulk of the pollution was man-generated, said Martin Williams, professor of air quality research at King’s. Diesel vehicles have been popular with motorists and encouraged by government because they do better mileage and cut CO2 emissions, but the scale of the air pollution health problem they present is only now becoming clear as new research shows how their exhaust emissions are linked to cancers, and heart and lung diseases. Air pollution can be compared to cigarette smoking and may worsen symptoms of heart failure, said Jeremy Langrish, lecturer in cardiology at the University of Edinburgh. “The predominate cause of death associated with air pollution appears to be cardiovascular disease. It’s clear from some work that was done that acute exposure to high levels of air pollution may actually be able to trigger acute cardiac events in patients that are at risk of such, so it may bring forward the onset of a heart attack. “From a heart point of view it is difficult not to draw a correlation with the similar effects that we see with cigarette smoke and on an organ-level these effects are very similar to the effects of smoking cigarettes, which we all recognise are bad for us,” he said. Children are particularly at risk from air pollution, said Jonathan Grigg, professor of paediatric respiratory and environmental medicine at Queen Mary University of London. “The danger comes not just from peaks in pollution, like we saw earlier this month, but also from long-term exposure. Britain has some of the highest levels of such pollutants in Europe. There is already strong evidence for diesel pollutants having an effect on cognitive function in kids. “People in large cities have lower life expectancy because of pollution. It seemed far fetched 20 years ago but now it is clear that the air we breathe has an impact on life expectancy. Air pollution alone does not kill you. But we think up to 200,000 people are having their health affected by PM2.5s [particulates with a diameter of 2.5 microns],” said Frank Kelly.